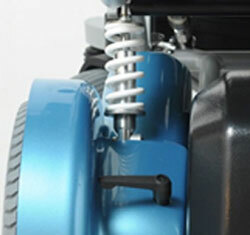 The Standup Premium Power Wheelchair with Stand-Up Wheelchair feature offers many health benefits previously unavailable to those in a wheelchair. By putting the body in a standing position, the chair provides users with better blood circulation, kidney and bladder functioning, as well as muscle tone. In addition the ability to place wheelchair-bound persons in a standing position reduces muscle contracture and bone decalcification, thereby reducing the risk of osteoporosis. 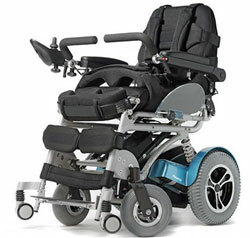 The chair features comfortable seat and back gel cushions, along with height and angle adjustable footrests. 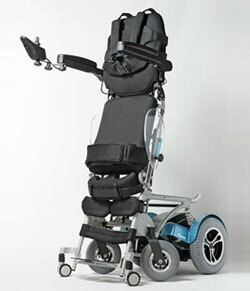 The chair runs off of 2 (12V) batteries, and has a 25 mile range, and the armrests are rotating, concave, and feature the controller on the right end.